The facilities on site. The house was very clean and the bed was comfortable. We stayed here for a week over Xmas, the property is great, kids loved the pool and indoor playground. There’s a small market, great for essentials, and a large supermarket in Dozulé. The house was well equipped, beds were comfortable, basic cleaning products were provided (there was a vacuum!) Staff was very friendly and helpful. The Village is in the middle of beautiful green area, safe and a short drive to Houlgate. Kids playground and entertaining is great. 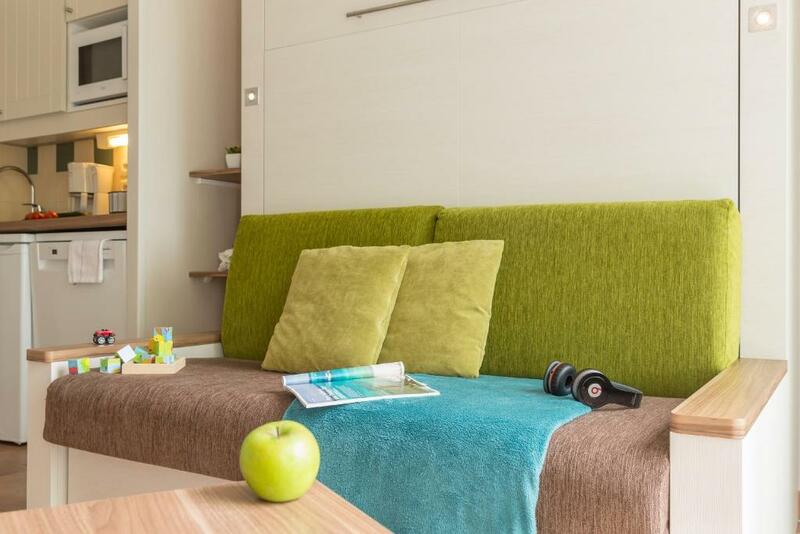 Apartments are moderately accessorised for a short stay. Spacious attached houses with all amenities needed. Great and comfy beds. Two baths, one shower/one tub. Plenty of space and a small deck outside. Would easily fit 6 pax, if two slept on the sofabed in the living room, however I can highly recommend a Superior for a max of 4 in order to be able to use the living room/kitchen during the evening/night. I liked the possibility we could do grocery shopping nearby (Super U - huge supermarket 6-7 km away), prepare our own food and live a little bit like home but still not further away from most sights - whether going North to Etretat or West to Omaha Beach on day trips. Also the hotel was facilitated with washer/dryer near the reception + a small minimarket. Go go go but stay away from the restaurant (franchised to a company NOT part of Pierre et Vacances). Liked the surroundings, swimming pools and kids entertainment. We had 2 balconies which enabled my dad (who is a smoker) to sit outside and enjoy the view. Liked the onsite restaurant and shop. Staff friendly and great english speaking. There was a lovely outdoor pool facility which we didn't use due to the cool weather. Pierre & Vacances Village - Normandy Garden in Branville in the Normandy region of France offers cottage-style houses and apartments with furnished terraces set on a 12-hectare estate. The houses are set around the central building, and the apartments are located in 4 buildings in the Garden Club Hamlet area opposite the tennis courts. They are all well furnished and have a fully equipped kitchenette. Some houses are duplexes. Guests can enjoy breakfast at the bar each morning. Pierre & Vacances Village - Normandy Garden also has a restaurant, O’Garden, which serves Norman specialties and gourmet desserts. A children's menu is available upon request. 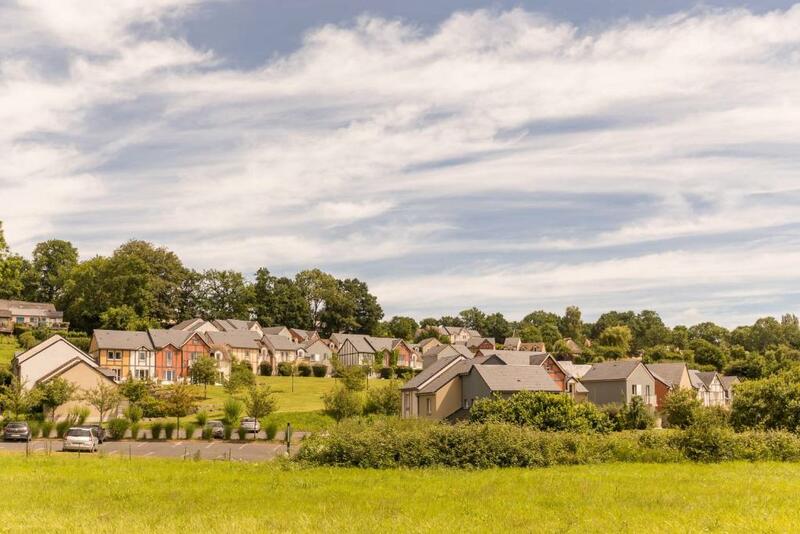 It offers views on the swimming pool and the surrounding countryside. 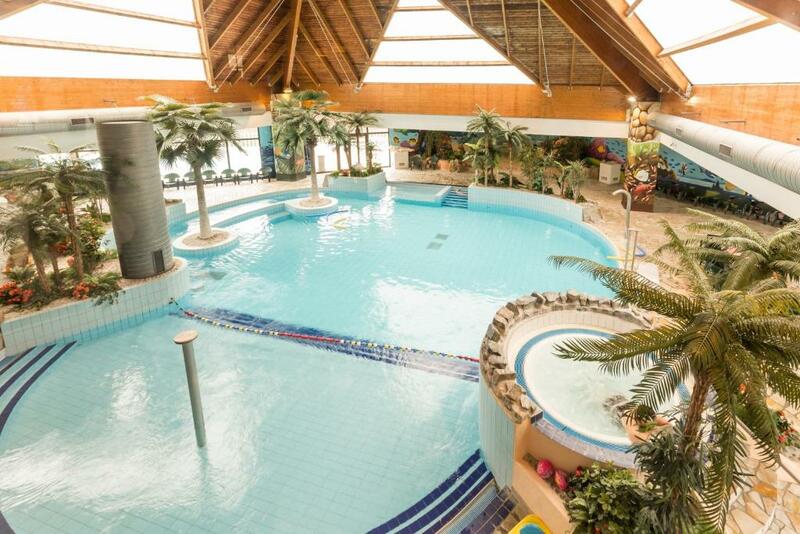 Guests are invited to enjoy free access to the covered tropical Aquatic Park and its swimming pools (with whirlpools, hot tub and children’s pool), sauna, hammam and children’s playground. Tennis is available at an extra cost. Special entertainment activities, kids club and a club for teenagers are organized during school holidays. Pierre & Vacances Village Club Normandy Garden is just 8.1 mi away from Cabourg and 11 mi from Deauville and Trouville. During school holidays, guests will be invited to attend an information forum every Sunday in order to find out about the week's activity program. When would you like to stay at Village Pierre & Vacances - Normandy Garden? This house is located between 600 and 2953 feet from the main building. It features a living area with 2 single sofa beds and a sleeping alcove with bunk beds. There is a double bedroom and a private bathroom with a bathtub or a shower. 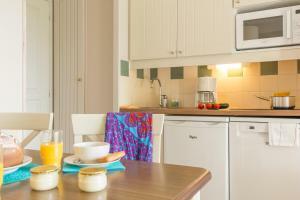 The fully equipped kitchenette opens onto the living area. This apartment features a living area with 1 pull-down double bed. There is a twin bedroom and a private bathroom with a bathtub. The fully equipped kitchenette opens onto the living area. This apartment features a living area with 2 single sofa beds and a sleeping alcove with bunk beds. There is 1 double bedroom. The 2 private bathrooms have a bathtub or a shower and the fully equipped kitchenette opens onto the living area. These duplex apartments are located on the 1st floor. This house is located between 600 and 2953 feet from the main building. It features a living area with 2 single sofa beds or 1 double sofa bed. There is a bedroom with a fold-out bed and either a double bed or 2 single beds. The private bathroom has bathtub and the fully equipped kitchenette opens onto living area. This superior house features a large patio. There is a living area with 1 double sofa bed. There is 1 double bedroom and 2 twin bedrooms. The private bathroom has a shower and the fully equipped kitchenette opens onto the living area. Some houses of this type are duplexes. This superior house features a living area with a double sofa bed and 1 foldable single bed or a pull-out single bed. There is a twin bedroom and a private bathroom with a bathtub. The fully equipped kitchenette opens onto the living area. Some houses of this type are duplexes. This superior house features a living area with a double sofa bed. There is 1 double bedroom and 1 twin bedroom. The private bathroom has a bathtub and the fully equipped kitchenette opens onto the living area. This studio features a living area with 1 pull-down double bed and 1 single bed. The private bathroom has a bathtub and the fully equipped kitchenette opens onto the living room. 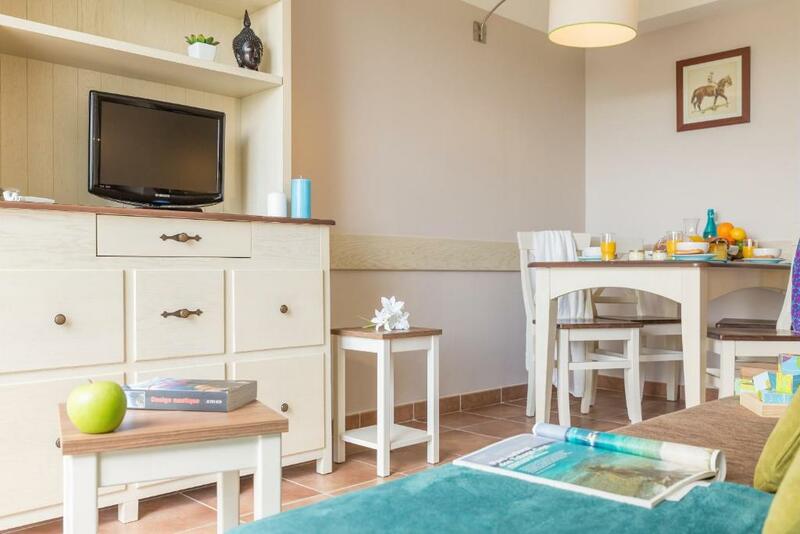 This studio is adapted for guests with reduced mobility. House Rules Village Pierre & Vacances - Normandy Garden takes special requests – add in the next step! Other Village Pierre &amp; Vacances - Normandy Garden accepts these cards and reserves the right to temporarily hold an amount prior to arrival. 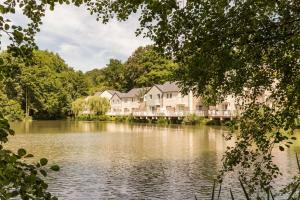 Village Pierre & Vacances - Normandy Garden accepts these cards and reserves the right to temporarily hold an amount prior to arrival. The outdoor, heated swimming pool is open from May to September. Price includes: bed linen, towels, 1 dish towel, 1 bath mat, 1 dish towel, a cleaning kit, basic WiFi access for up to 5 devices, charges and taxes (except city tax and application fee), access to the pool area and playing/sports field (except tennis and archery) and basic activities such as fitness, contests and parties. End-of-stay cleaning, except the kitchen area and dishes, is also included. Available at an extra cost: beds made upon arrival or housekeeping mid-week (The number of services purchased must match the number of occupants in the accommodations). Please note that the half-board options must be booked for the total number of nights reserved. Please note that the children's club is open during spring and summer holidays but is closed during autumn and winter school holidays. During that time, children will have free access to a playground area under the parent's responsibility. A baby kit including a cot without a mattress, a high chair, a changing mat and a pushchair for children aged 0-2 years is available for a supplement. Guests are required to reserve a kit in advance. The kitchen is very small- ok for a few days though. Position of the house - too much climbing. Meals expensive with 2 children. Bed is very uncomfortable - Very small queen size to be pulled from a wall furniture - Pillows are very soft and flat. Bathroom is very old and not well maintained with no Hairdryer (although can be given free at reception). Pool area is great although heavily overcrowded during peak hours with zero adult area reserved (e.g Jacuzzi). The house 502 we stayed in is next to a generator, which means that the cottage's garden is smaller and tgere is a constant buzz. Don't stay in neither 501 nor 502! The houses in that row are also next to a road. It isn't a big one, but fence is super low and one feels additionally exposed. The house is two floors one - but it doesn't have any safety gate to prevent i.e. Kids eventually falling down from quite steep stairs. If you travel with smaller kids (we were), don't take it. The resort is clean, spacious and has a fair leisure time programme. The swimming pool, sport facilities and indoor playground are definately assets. All is well maintained and staff members are professional and helpful. The resort is well located and there is plenty to do - both within the resort's programme, as also in the neighbourhood. The staff is very helpful in providing information about it. - The "house" we got was rather small, i cannot imagine how 5 adults could fit (that's what they mentioned), we found it suffocating with one 3 year old and a baby. - The video of this resort does not picture the reality. It shows modern apartments while the one we got is left to its fate; outdated furniture, holes on the curtains, humidity signs, fungus around the windows! - Extremely high prices at the small super market; the restaurant opens for dinner at 19:00, I don't call this child friendly! We got one tasteless coffee at the bar of the restaurant and had to pay 3,70 Euros! - 6 euros washing and 3 euros drying for one wash-dry circle, unbelievable! This is definitely not child friendly. Overall a disappointing resort. The location was nice and the swimming pool too. No kettle no saucepans no cutlery and all the plates and cups were chipped room was dirty and cobwebs all over and a musty smell. How can it be self catering when you can't even make a cup of tea Boil an egg.every thing is in French no English. A few things you need to know before you go. Lovely place but very steep hills so either take the car everywhere or be prepared for a hike if your place is not near the main facilities. There are stepped footpaths separate from the roads which are quite windy and have no pavements. Watch out for children playing in the road or stepping out from footpaths behind bushes. There was no oven in the property but we had already spent £135 at the supermarket so had to fry chips and cook pizza and everything else on the hob or microwave. The stairs were very steep and there was no handrail on the top half. Would be difficult for toddlers or people with mobility problems. Perhaps bring a portable stair gate if you have toddlers. There was room to put a cot or even two in the double bedroom. The rooms all had window/doors which could be opened by a child giving no way to prevent a child from getting out onto the balcony or into the garden. Only the front door was child proof. You could probably solve this if you move the beds in front of the windows as they open inwards. Otherwise you could put door alarms which you would need to bring with you. The TV signal is poor and everything is dubbed in French so you won't be spending your time watching TV. You could attach DVD player, laptop etc to TV if you bring them and the correct HDMI cables. The beds were very hard and uncomfortable. I do have a bad back so I find this everywhere so you may be okay. Helpful, friendly staff who speak English. Clean and pleasant property. (no. 911) plenty of crockery etc. Very similar to Center Parcs in UK but not as spacious in living area. Property for six people had one double bedroom, one room with two single beds and a sofa bed in the lounge. This was not suitable as a sofa as there was no back to it and needed three cushions for any back support and would seat 3-4 people max. Large table and 6-8 chairs in garden. Also large drying horse for laundry. We did self-catering so did not try the restaurant on site. Swimming pools lovely, showers by pool just a drizzle though. Life jackets for babies and toddlers at poolside. Lifeguard at indoor pool. Sauna and steam room by pool. Lots of sporty activities and kids clubs. Games room with air hockey, small table football and a few arcade games. Sports tournaments throughout the week. Twenty minute drive from lovely beaches at Villers-sur-mer, Cabourg and others. Half hour from Caen, large town with Castle, shops, restaurants, museum. Nearby town of Dozule has SuperU supermarket but is expensive. Lidl near Ouistreham is cheap but 30-40 minute drive away. Also Lidl in Cabourg. Lots of lovely patisseries everywhere!